I like how the author likes to give you just enough clues so that you think that you know whodunit but then gives you another clue to let you know that wait a minute it may not be that person after all. She likes to keep you guessing. 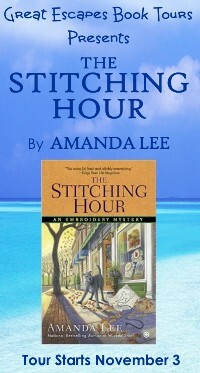 A full 5 stars for this addition to the Embroidery Mystery series. The mystery was fun and fast paced. I loved this book and read it in one day….You will be hooked from the start. I love this series. 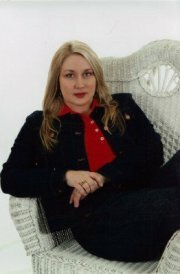 Marcy is independent, determined, and such a genuinely kind woman. Her dog, Angus , a giant Wolfhound, is such a sweetie. And her shop sounds like a place I could spend hours in. This well-plotted mystery kept me guessing! It was an enjoyable read with strong characterization and dialogue that moved the story along. 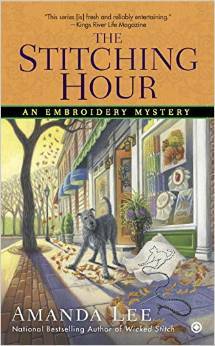 The Stitching Hour was a fun, quirky read with a sinister twist that I didn’t see coming. Anyone who enjoys a not so easy to solve mystery with interesting characters, and a fast moving plot will enjoy this one. I enjoyed the entire story–the main mystery as well as the subplots. I was totally blindsided by the revelation of the killer, although it made perfect sense once it was revealed. Each visit to Tallulah Falls makes me love the people (and Angus, Marcy’s Irish Wolfhound) even more. I hope to continue to hear from the folks there for a long time to come!